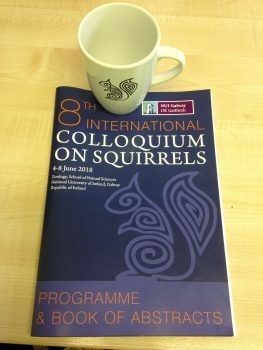 I was delighted last year to learn that the 8th International Colloquium on squirrels, an international gathering of squirrel researchers from around the world, would take place on my doorstep at the beginning of June 2018. OK, I admit I exaggerate just a little. I live 22km north of Galway city and the venue for the colloquium was in fact the Arts Millennium Building of National University of Ireland Galway (NUIG), which is within walking distance of Galway city centre. But, when you look at the locations for the previous meetings, USA (Pennsylvania 1994; Oregon 2000), England (2003), India (2006), Canada (2009), Japan (2012) and Finland (2015), you may understand why I felt this colloquium was a local event. I am going to resist defining the term ‘colloquium’, because you can easily find many definitions of the term on the web (clue – essentially the same as a conference), so instead set the scene by quoting Dr Colin Lawton’s introduction from the book of abstracts. The International Colloquium on Squirrels is a global event that is held every three years. It brings together squirrel researchers to discuss all aspects of squirrel biology including ecology, behaviour, evolution, morphology, genetics and conservation. 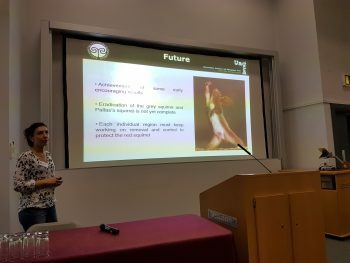 Originally focussed on tree squirrels, the colloquium was expanded to include flying squirrels at the 4th meeting in Kerala, India, and in Galway the programme was further expanded to include the ground squirrels, so completing the whole Sciurdae family. 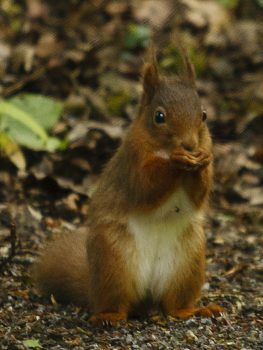 Red squirrel © Ruth Hanniffy. In Ireland we have only two representatives of this family, the red squirrel and the North American grey squirrel, so it was a treat to learn about animals that went by the names of the big cypress fox squirrel, red-cheeked ground squirrel, Japanese giant flying squirrel and even yellow pine chipmunks. I have been lucky during the course of my work to be able to attend many international meetings on bats and mustelids, but this was my first time to attend one solely devoted to another mammal family. It didn’t surprise me, however, while sitting at the oral presentations to discover that squirrel folk are as devoted to their research subject as those of us working on bats or pine martens. Maria Vittoria Mazzamuto presentating at the Colloquium © Colin Lawton. Other similarities were the research topics, with papers on ecology, management, behaviour, conservation, taxonomy, genetics and morphology. One difference though that came to mind was the topic of management. 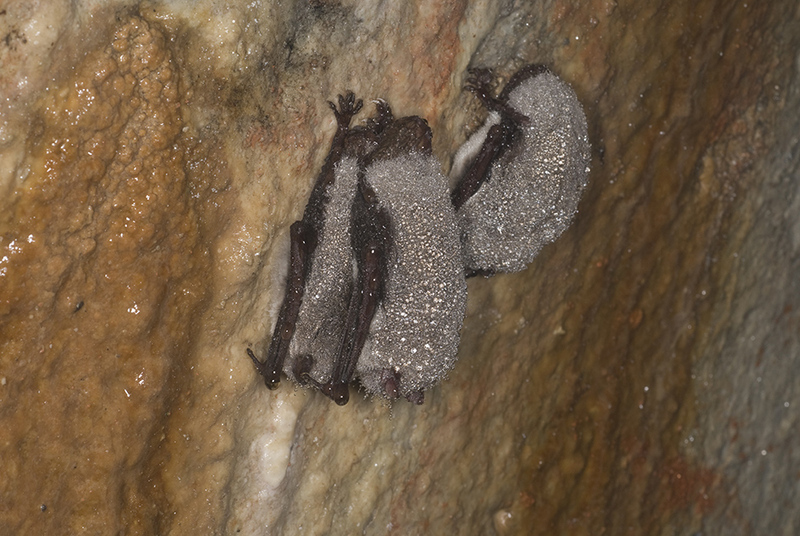 At bat conferences this usually refers to implementing mitigation measures to counter negative changes to the roosts or foraging grounds of bats due to road or housing developments. But this topic can mean something quite different for members of the squirrel family. Several papers addressed research into ways to manage those species considered pests of food crops, for example, zinc phosphide-coated cabbage is being investigated as a way to control Belding’s ground squirrel in parts of north-east California and south-eastern Oregon where it is a significant pest of alfalfa. 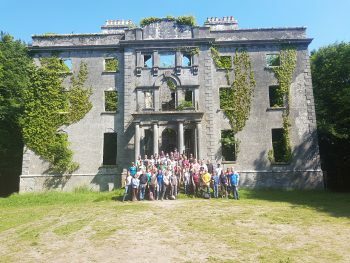 I was able to repay the delegates for sharing their knowledge mid-way through the colloquium by providing them with a guided walk in a wood on the shores of Lough Carra, 60km north of Galway City. This wood contains the ruins of Moore Hall House, the basement of which is a hibernation site for hundreds of lesser horseshoe bats but where you can find low numbers of this species at any time of the year, and barn owl chicks by summer. The ruin also provided a suitable backdrop for the obligatory conference photograph. Located elsewhere within the wood is a two-storey building, the former granary for the demesne, which was renovated by the National Parks and Wildlife Service (NPWS) as a maternity roost for the horseshoe bats. As we walked in front of both buildings, I asked all the delegates to speak quietly to prevent disturbing the wildlife within. 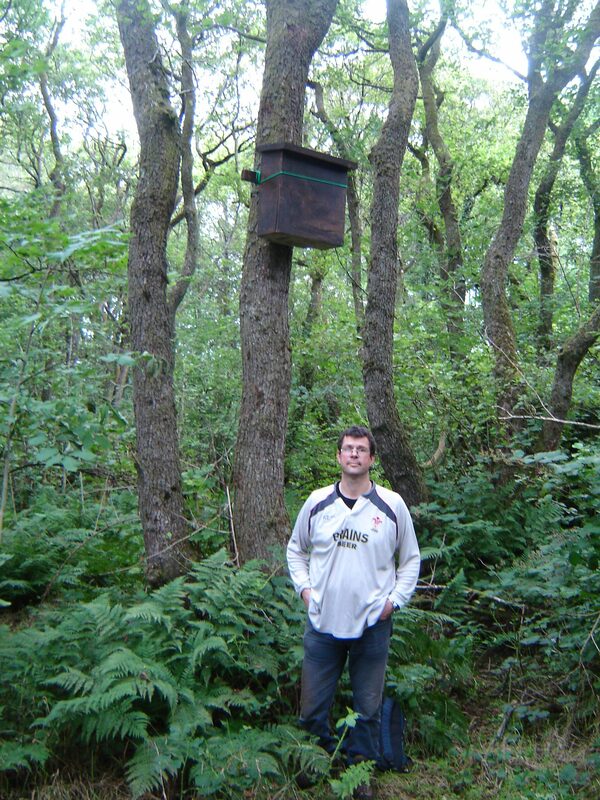 I’ve been involved with conserving and monitoring the bat colonies at these two sites in partnership with the NPWS since the mid-1990s, but never suspected that one day I would be instructing a group of squirrel experts to tip-toe past them! Attendees of the Colloquium © Colin Lawton. I am grateful to Dr Colin Lawton, conference organiser, for inviting me to join the organising committee but especially for giving me a delegate pack, so I have my own souvenir colloquium mug. Souvenir mug and delegate pack.